UPDATE: Congratulations! Becky and Cindy have each won a $20 gift certificate to Rocky Mountain Chocolate Factory in Nanaimo! Thanks to all who entered. Even if it’s just in our heads, I think most people would agree with me when I say that food tastes better when it’s made locally. Particularly if that food is of the chocolate variety! Since opening at Departure Bay ferry terminal in August, 2010, the Rocky Mountain Chocolate Factory has made it their mission to craft incredible fair trade chocolates. 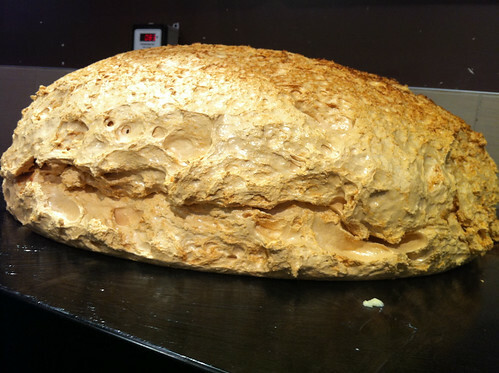 Combined with that chocolate and lovingly made from scratch, RMCF has been creating caramel, brittle, fudge, seafoam (honeycomb toffee, see photo below) and rockypop (caramel popcorn with nuts) right in-store. The tantalizing smells making their way from RMCF’s shop are impossible to resist! The privilege of experiencing RMCF’s sumptuous samplings has been limited to those traveling out of Nanaimo by ferry. However, with the Christmas season fast approaching, RMCF has loaded up their sleigh with some of their most-loved treats and are setting up shop in Nanaimo’s North Town Centre mall. Watch for their pop-up shop as of November 7th near the Fairway Market entrance. Would a 1/4-pound chocolate peanut butter cup tickle your taste buds? 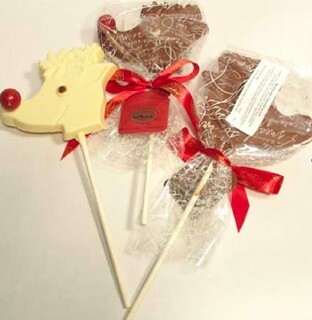 Or perhaps a handful of reindeer chocolate lollipops? To celebrate the launch of their Christmas 2012 pop-up shop, RMCF has offered up a $20 gift certificate to two Keira-Anne.com readers to be used at their Christmas pop-up shop! I will draw two winners at noon on Wednesday, November 14th! Good luck! Winners must be 16 years of age or older. Winners cannot have won a contest on Keira-Anne.com within the last six months. This prize is not transferable and is of no monetary value. Keira-Anne.com nor its affiliates or the contest prize sponsors bear any responsibility to the winners, the collection of the prize and/or the use of the prize. Photos courtesy of Rocky Mountain Chocolate Factory Nanaimo. Don’t forget! Until Thursday, November 8th you can enter to win a gourmet tea subscription from Amoda Tea! It really doesn’t get better than chocolate and peanut butter!! My absolute favorite chocolate treat is snowballs. Forever. Rocky Road Fudge…actually pretty much anything they make is totally delicious!!! Dark Chocolate with Almonds is my fave! My fave chocolate treat is dark chocolate with mint. RMCF’s pecan clusters and english toffee are a close second. 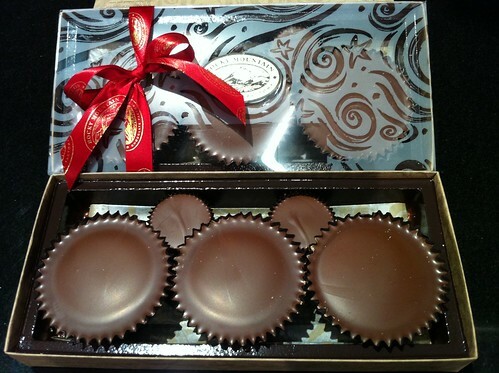 Added Rocky Mountain Chocolate Factory on Facebook as a friend. I have a weakness for their Skor caramel Apples… and I’ve been friends with the Rocky Mountain Chocolate Factory for a while now! Yum! Absolute favourite is the Apple Pie Apples. I could easily sit down though and finish off a bag of cordial cherries though if you twist my arm. Oh and I am already FB friends as soon as I saw they were on FB.Need to keep up on the chocolate updates. Long live peanut butter cups. Yum!! !